Kristin Addis is a former investment banker who sold all of her belongings and bid California goodbye in favor of travelling solo throughout the world while searching for off-the-beaten path adventures. There’s almost nothing she won’t try and almost nowhere she won’t explore. You can find more of her musings at Be My Travel Muse. Connect with her on Twitter and Facebook. 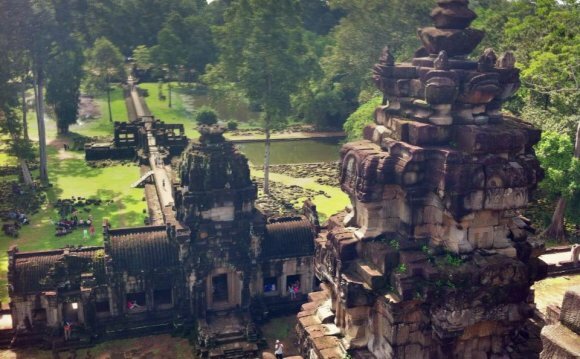 How is it possible to pin-point the je ne sais quoi of a Southeast Asia backpacker? Perhaps he has sak yant tattoos, sun-bleached hair, or that tell-tale neon “in the tubing” tank top. He thrives in an environment with rabid motorbikes and their Kamikaze-like drivers, works best under the influence of a light beer or two, and is likely to be the life of the party – able to socialise any time with anyone. 1. You have a flip-flop tan. 2. You’ve been through at least five pairs of genuine fake Ray Bans. 3. You’ve been through a similar number of fake Beats headphones and Havaianas flip flops (thongs, jandals, sandals). 4. Shoes have become less and less compulsory to you. 5. You have a strong inkling towards getting, or already have got, a travel tattoo and/or piercing. 6. It’s really exciting to you that the harem pants fad is catching on back at home because then you never have to stop wearing your Southeast Asia garb. 7. You have more or less forgotten about the existence of eyeliner and concealer. 8. The mere concept of a blow dryer and curling iron have become laughable. 9. You either already have or are suddenly inexplicably amenable to the idea of dread locks. 10. You can be very easily persuaded to spend 75 cents on a fruit shake. 11. You cannot be very easily persuaded to part with more than $3 for a beer. 12. You know how to say “hello, ” and, “thank you, ” in about five different Southeast Asian languages. 14. You arrange your plans around the next full moon. 15. There’s still neon paint stuck to your Megan Fox tank top from the last one. 16. It’s okay because you totally have more than one Megan Fox tank top. 17. “Bucket, ” suddenly has one meaning, and one meaning only: one-beverage inducer of black outs. 18. You no longer find monkeys to be cute or even tolerable. 19. You’ve become an expert at sitting on chairs and stools that hover mere centimeters off the ground. 20. You’ve become some kind of an expert at communicating with your hands and facial expressions. 21. Your daily routine involves a morning ritual of DEETing from the feet up. 22. Instead of seeking out mirrors, you slink by, trying not to look at the dirty vagabond you’ve become. 23. You’re totally going to learn how to play guitar. 24. You’re totally going to take up fire dancing. 25. You’re positively giddy if you find a bathroom with a western toilet, toilet paper, AND soap inside. 26. That said, you’ve mastered the required movements for the squat toilet. Out of necessity. 27. Hot water is no longer a strict requirement for your showers. 29. …and sometimes neither is soap. 30. You’ve tried (and later regretted) some kind of rice liquor. 31. Someone, at some time, has taken you for a ride on a tuk tuk or taxi, and you’ve overpaid like crazy for it. 32. You’ve eaten street food you never would have considered previously. 33. You can’t believe how delicious it was and how much you want to eat it again. 34. You’re seriously considering taking up a teaching job so that you can stay. 35. Your bamboo bungalow doesn’t even have proper walls, yet it makes you happy. 36. You can totally go, like, three whole days without Wi-Fi. 37. Yet once you find it again you’ll be glued to your phone, even if it does take an hour of painstaking refreshing to finally load a single Facebook message. 38. You keep reassuring your family that you’ll buy your plane ticket home, “tomorrow, ” which never seems to arrive. 39. Yes, fried rice IS a food group. 40. You are the Jenga-freaking-master of the universe. 41. You’ve, like, wholly tapped into your spiritual side. 42. All you need are good vibes, good people, and a daily dose of Ujjayi breathing. 43. Lotus flowers are so thoroughly inspiring. 44. You’ve become all willy-nilly with your passport. 45. The random hostel guy has kept it overnight. 46. So has the visa service guy who took it to the capital for you when you didn’t feel like leaving the beach. 47. You’re used to eating really, really well for very, very little money. 48. You don’t even really need electricity. 49. You now have friends from all over the world. 50. You have the painful task of leaving a piece of your heart in the coolest part of the world, ever. If this list's got you all fired up to join the harem-panted and bucket-clutching crowds currently circulating this part of the world, there's no better accommodation hook-up than us. Check out our user-rated listings for Thailand, Vietnam, Cambodia and Laos today, and book at the best price.